The ROSE Residency Programme, the Istituzione Bologna Musei 2018 has selected the following artists: Dina Danish & Jean – Baptiste Maitre (collective) and Catherine Biocca Assessment Committee: Lorenzo Balbi, Artistic Director, Museum of Modern Art of Bologna; Lorenzo Giusti, Director of Bergamo Modern and Contemporary Art Gallery; Eva Marisaldi, artist; Giulia Pezzoli, Curator of “ROSE” Residency Programme; Kate Strain, Artistic Director, Grazer Kunstverein. Mit Arbeiten von Anna, Stefano Calligaro, Dina Danish, Hendrik-Jan Hunneman, Rhoda Kellogg, Christopher Knowles, Marijn van Kreij und Isabel Nolan. 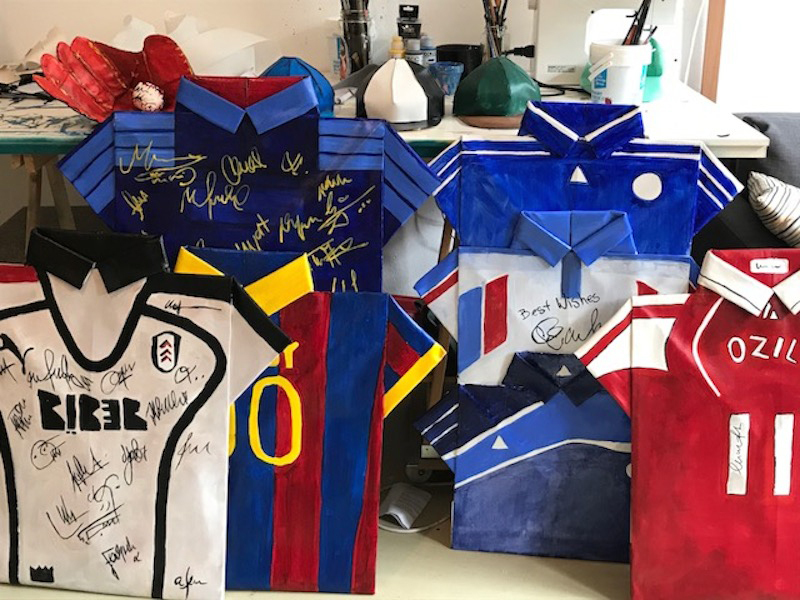 For the solo show Sports Memorabilia, Signed and Everything a collection of paintings, drawings, and sculptures that look into sports memorabilia, especially those from US collections are presented. a group show of editions and multiples, in which a two multiples by Multiple Choice (Dina Danish, Rumiko Hagiwara and Jean-Baptiste Maitre) will be on display. Kunsthall Oslo is very pleased to invite you to the alternate reality of The Oslo Museum of Contemporary Art. Come and see, for a short time only! fantastic artworks – sculpture, paintings, drawings, photographs, film, performance – by a hundred artists who have lived or worked in the city of Oslo over the past fifty years, but who are not represented in the collection of Norway’s National Museum. The show offers an overview of the currently vibrant Oslo art scene, as well as a salute to the many venues and platforms that have contributed to the diverse, experimental and international history of art in Oslo over the last half century. Exhibition features Maria Barnas, Yael Bartana, Otto Berchem, Sander Breure & Witte van Hulzen, Jasmina Cibic, Dina Danish, Peggy Franck, Dora García, Sigurdur Gudmundsson, Hedwig Houben, David Jablonowski, Gabriel Lester, Alexandra Leykauf, Cristina Lucas, Chaim van Luit, David Maljkovic, Navid Nuur, Paulien Oltheten, Anna Ostoya, Oscar Pabón, Susan Philipsz, Amalia Pica, Falke Pisano, Antonis Pittas, Sue Tompkins. Artists included in this show are Kerstin Cmelka, Dina Danish, Jeremiah Day, Dora Garcia and Zhana Ivanova. A group exhibition with Dora Garcia, Carl Andre, Dina Danish and Christopher Knowles. Curated by Noor Mertens. Featuring works from the collections of Maja Hoffmann and Michael Ringier and curated by de Kris Dittel and Emma Panza; mentored by Lorenzo Benedetti. Dina Danish, Being a Pinball Machine, 2014. Photo by Jean-Baptiste Maitre. A two-day programme looking at the potential of language in art inspired by the writing of Jack Spicer with participation by: Ben Cain, Dina Danish, Mary Hurrell, and Camilla Wills. The dispute and the inquiry that followed. Dina Danish, A Simultaneous Poem by Charlie Chaplin ..., 2014. Performance, photo by Ernst van Deursen. contributors include: Sophia Al-Maria, Renata Cervetto, Sebastian Cichocki, Dina Danish, Kris Dittel, Chris Fitzpatrick, Krõõt Juurak, Lara Khaldi, Ieva Misevičiūtė, Robertas Narkus, Emma Panza, Pavel Pepperstein, Michael Portnoy, Aneta Rostkowska, Kate Strain,Katarina Zdjelar and Arnisa Zeqo. Dina Danish, A Simultaneous Poem by Charlie Chaplin..., 2014. Performance, photo by Ernst van Deursen. Meggy Rustamova, Search in depth, 2013. Photograph, dimensions variable. Programme: Father, Can't You See I'm Burning? The simultaneous poem by artist Dina Danish will be relayed by the six curators of the Curatorial Programme as a press conference. If this simultaneous poem were to take place it would be executed by Kurt Schwitters, Charlie Chaplin, I.K. Bonset, the ridiculously good-looking Lettrist International and Everybody Else.